As expected, our physicists’ understanding of polarization is as bad as their understanding of wave motion. A wave proper is actually a 3-dimensional phenomenon (hemispherical or umbrella shaped) which moves away from its source as it propagates in the medium. We can imagine a ‘transverse wave’ as something like the horizontal section of that 3-dimensional phenomenon or wave proper. 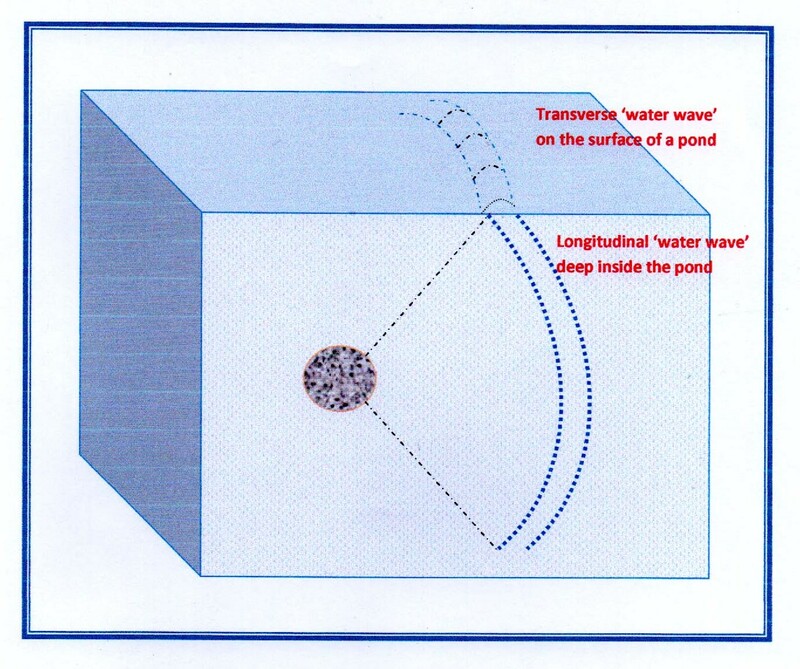 In other words, what we see as a ‘transverse wave’ or a tide on the surface of a pond merely represents the ‘cut edge’ of a much larger, submerged 3-dimensional phenomenon. ‘Transverse waves’ being a surface manifestation, they lend themselves for direct observation and whatever we observe of the surface waves holds true for the underlying longitudinal waves because the former is nothing but the surface manifestation of the latter. I am proposing that light waves are nothing but longitudinal waves (or ‘umbrellas’) traveling in the cosmic ocean of Ether (just like the sound waves traveling in water or air medium). And as is the case with sound waves, the ether particles oscillate to and fro as light waves propagate in the ether medium. Now how do we explain polarization of light waves? Very simple if one understands what actually happens in polarization. Now imagine a cluster of point sources and each generating a train of waves. Obviously waves from one point source cross or interfere with those from other point sources as they propagate. And this is exactly what happens with unpolarized waves. Different waves interfere with each other in a random/ haphazard manner. These unpolarized water waves become polarized if we make them pass through a slit. Also, as waves propagate in the pond, they become polarized to some extent i.e. they tend to arrange themselves parallel to one another. The above model explains polarization in simple and clear terms. Of course, a lot more happens at a deeper level. Actually the explanation provided by the physicists for light polarization is rather messy (as is always the case in physics). They first describe light waves as transverse waves with electrical and magnetic fields oscillating at right angles to each other. Then they ignore the magnetic field component and imagine light waves as having only the electric field component. Thus ‘by convention’, they depict EM waves as having only electric field component when they talk about polarization. Now it becomes easy for them to explain how the light waves with vertically oscillating electric fields pass though the vertical slits in the polaroid filter. The magnetic field which supposedly oscillates at right angles to the electric field, apparently doesn’t hinder the passage of light waves through the slits. Why? Well, our physicists decided to ignore the magnetic field, so it doesn’t exist for them! So the horizontally oscillating magnetic field can’t stop the light waves from passing trough the vertical slits! Isn’t that a great explanation? What is pity is that our physicists don’t realize the difference between ‘conventional’ and ‘real’ while they explain the phenomenon of polarization of light! hey nice to hear from you again. Tho an interesting insight on polarization. however em waves are transverse ant follow the inverse square law whwn it comes to attenuation. very early radios and transmitters were supposedly working on longitudinal em waves which were swiftly outlawed ( presumably because longitudinal em waves have immense weapons potential ) and this gave birth to transverse wave radios and transmitters. Now it is claimed longitudinal em waves do not exist. Savvy, thanks for your input. As I have explained here and elsewhere on this blog, there aren’t anything called transverse waves. All waves, including EM waves are longitudinal waves. The so called transverse waves that we see in a pond are nothing but the surface manifestation of the underlying longitudinal waves. The description of EM waves as perpendicularly oscillating electrical and magnetic fields is just one of the several mythical notions in modern physics. Great blog and I agree with your defamation of quantum “so called” physics. Excellent explanation of the double slit experiment. We have a lot to learn and especially relearn. Thanks Patrik for your comments. I would say Michelson-Morley experiment is the most unnecessary, confusing and misleading experiment in science. Its like studying the cosmic microwave patterns and start light bending to know whether our physics professor is really bald or not. And the mislead students unnecessarily fight amongst them about what exactly does the cosmic data indicate with regards to the professor’s bald head. Same is the case with MM experiment. The less we talk about it, the easier we get to the truth. There exist more direct observations and much simpler data to tell us about ether etc. drgsrinivas, Enjoyed reading this. A few thoughts. In my mind, I picture electricity/EM moving down a wire differently than say radio EM. Different boundary conditions. It’s also possible that when electricity moves down a wire, the magnetic and electric portions are twisting/corkscrewing past each other. This would maintain the perceived sinusoidal and perpendicular aspects of the EM components. And just because we can’t hear sound in a vacuum doesn’t mean there isn’t a wave. Imo, clapping hands in outer space creates your umbrella waves in the ether (perhaps they move at the SOL).